Aruma welcomes individuals of all levels to join. The word “yoga” means “to unite” and refers to the fusion of body, mind and spirit through meditation, breathing and physical postures. Aruma yoga, is inclusive yoga. Our teachers are committed to supporting you in your practice, whether you are just starting out or you have an established practice. We believe in the benefits of yoga and encourage you to participate in a daily practice that will improve your respiration, strengthen your immunity, lower your risk of disease, increase your flexibility, boost your vitality and empowerment, restore your balance, and prepare you for change. Please view our class schedule and descriptions to choose the classes best suited for you. Classes range from 60-90 minutes in length. This 75 minute yoga class combines gentle yoga poses with breath work to build strength, space, and body awareness. With added elements of restorative stretching, meditation, affirmations, and/or music to package you back up. Open to all levels, great for anyone looking for a more gentle flow, new to yoga, or those searching for the therapeutic benefits of yoga. Come connect your mind, body, and spirit. A morning practice to guide you into all the day has to offer. A balanced combination of sustained and flowing poses, healing hands on assists, with attention given to yoga basics and therapeutic principles. Open to all levels. This 90 minute class uses a combination of strength building Hatha flows, balancing postures, breath work and hands on assists, to support you in seeking your soul’s purpose. This class is designed to help you discover your inner strength, while challenging your core, strength, and flexibility. Come join us for a soul revealing experience! A 90 minute full service self-care experience! Begin with a 45 minute strength class that will awaken your muscles from shoulders to calves. Come prepared to sweat. Then transcend yourself into a complete restoration and renewal of your body and soul, as you are guided through 45 minutes of yoga and deep stretching. The perfect combination! This 90 minute yoga class is a more vigorous practice designed to uncover the Warrior’s Heart that already resides within you. Through heart opening asanas and breath work, you will begin to remove the emotional shield that prevents us all from connecting to our true source of beauty. In a safe and nurturing environment, you will challenge your core, strength, and flexibility in a way that supports your heart in being more resilient and free. This class is open to all levels, so come discover your Warrior’s Heart! Reset your mind and restore your body in this 75 minute yin inspired practice. 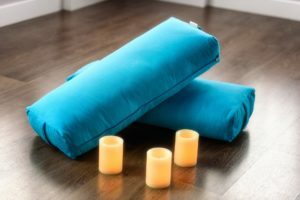 This class places an emphasis on reconnecting your mind, body, and soul, through repetitive asana flows, healing yin poses, and guided meditations. A necessary self-care experience. Open to all levels. Strong Teen Mentorship With A Raw, Heartfelt Approach. Girlvana is a program that provides teen girls (ages 13-18) with the tools to better navigate life through yoga, meditation, and female mentorship. It is brand new to Eastern Canada and Aruma's, Bobbi McDougall, is one of eleven women in Ontario certified to provide this essential service to teen girls in our area. 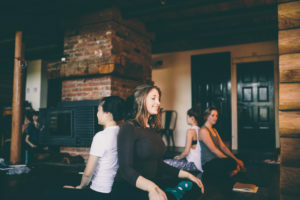 Girlvana instructors encourage real conversation and are always open to sharing their own personal stories and experiences on why they practice yoga. Instructors are fully insured, with first aid, and a minimum 200 hour yoga teacher certification, whom have been specifically trained to work with the teen population. During a Girlvana class the majority of time is spent instructing these young women through a yoga practice. We teach an uplifting, flow-based practice that provides a physical challenge, but still emphasizes slowing down, relaxing and letting go. We are trained to lead specifically to teen groups, therefore our classes are light hearted, set to music, engaging, and questions are always encouraged. By teaching poses that are accessible and can be done anywhere our hope is that the next time a girl feels stressed or anxious they can recall a pose they did during yoga and use it as a way to reground and focus. We believe that yoga has the power to create a shift in how girls relate not only to themselves but to others. Girlvana is not just about yoga; interactive games, journaling, check in questions and guided meditation are used at the beginning and end of each class as a way to facilitate open, honest, real dialogue that is centered around issues many teen girls face today. Body image, confidence, self-care, inner dialogue, and healthy relationships are just a few of the conversations that have been sparked from a Girlvana led class. Girlvana provides a safe space for girls to share, and ultimately feel validated. We believe that through sharing we can empower each other, cultivate connection to other females, and find peace in knowing that we are not alone. Stay tuned for upcoming Girlvana offerings! Stand Up Paddle Board (SUP) Yoga aims to introduce you to a unique yoga experience while enjoying the natural splendor of floating on water. This unique activity combines a variety of asanas that our certified instructor, Bobbi McDougall, will adjust to the status of all participants, according to your ability and prior experience. If you are looking for a new challenge, SUP Yoga, will reinvigorate your body and feed your soul. Join Bobbi, this Summer and Fall, in one of our many SUP Yoga offerings on the serene Clyde River. Her intimate classes (5 participants maximum) will challenge your balance and bravery, while embracing the beauty of the outdoors. We provide all of the equipment, so just come and unwind. NO REFUNDS. If class is rescheduled due to weather a credit will be applied to your account. Our workplace yoga program provides yoga classes in the workplace to reduce stress, increase energy, and improve workplace morale. By improving the overall well-being of your employees you can expect a dramatic increase in worker satisfaction and engagement. Studies repeatedly show that healthier and happier employees tend to feel better about their jobs and are more effective with their productivity. All of Aruma's Workplace Yoga’s yoga instructors are fully certified with a minimum of a 200 hour certification course with a well recognized Yoga Teacher Training program; they also carry liability insurance and are trained in Emergency First Aid and CPR. Our yoga classes are designed to fit the needs of the individuals in each group, and are suitable for almost anyone, even absolute beginners. We recommend practicing yoga at least twice a week, but even once a week will have noticeable results. Please contact us for additional information or to schedule yoga in your workplace.